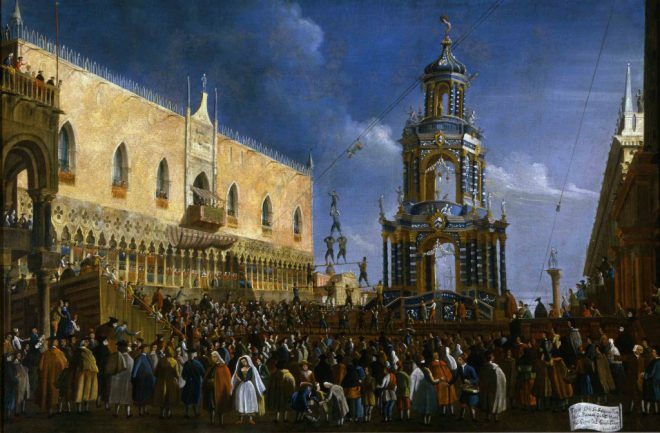 Gabriel Bella, Fat Thursday Festivity in Piazzeta, 18th century. Collection of Fondazione Querini Stampalia, Venice. As part of its regular Friday Nights at NOMA programs, the New Orleans Museum of Art and the Cervantes Fundación Hispanoamericana de Arte throw the masked Mardi Gras Mambo Ball. The museum also opens “A Life of Seduction: Venice in the 1700s,” a new exhibition presenting paintings, costume, and furnishings from 18th-century Venice. Admission is $10 in advance and $12 at the door. Tickets are free for NOMA members. For more information, visit the museum’s website.